You are here: Home » Learn & Live the Faith » Apologetics » Spiritual Food for Our Troops! Maybe it comes from watching too many M*A*S*H reruns where Father Mulcahy seemed to be right there whenever a soldier needed him, but I always assumed that our service men and women had easy access to a chaplain whenever they need one. I also assumed they could easily attend regular religious services. But with U.S troops stationed in more than 75% of countries around the world (our troops are currently in 150 of 196 countries), this is just not the reality. Case in point. Last winter my son, who is a U.S. Marine currently stationed here in the U.S., had a number of issues weighing him down. He had witnessed some terrible things that had happened on his base. Add to that military inefficiency and three reasonable requests for leave (which he was due) being turned down, and he was at a low point. Now, my son’s phone calls to me usually last 2 minutes and 34 seconds (yes, I time them–I am shooting for 3 minutes!). And Marines are not generally known for decompressing with their moms, but after few late night phone calls where my son “needed” to talk to me, and after spending more than thirty minutes on the phone together on a number of occasions, I began to grasp the level of stress that my son, and many of our service men and women are under. Remember, he is not even in some challenging place like Afghanistan, but right is here in the U.S.
After talking to another Marine mom with more experience in this area than I have had, she recommended I call the chaplain on my son’s base. I decided to do so just to make sure I knew how to reach the chaplain in the event my son needed more than feedback and support from me. After more than an hour scouring the internet, and making a number of phone calls, I reached the chaplain’s office. Unfortunately, no one knew when or how I could reach the chaplain so I decided the best option at this point was to stepped up my prayers for my son, asking the Lord to give him peace. Putting this in perspective, there are currently 1.4 million active-duty soldiers who identify themselves as Christians, but there are simply not enough chaplains serving them. There are only 240 Catholic chaplains for 330,000 Catholic service members. This lack of access to spiritual comfort and worship puts our troops at risk, both spiritually and psychologically (U.S. troops are currently averaging one suicide per day). It also puts undue stress on the families of our armed services. Three years ago, Cheri Lomonte, founder and director of Mary’s Touch and co-host of Mary’s Touch Radio, had just finished an interview. One of Cheri’s guests asked Cheri to pray for her son who had been in Afghanistan for nine months and had not seen a chaplain in all that time. Mary says that at that exact moment, she knew that the Holy Spirit wanted her to help our service men and women, and their chaplains. Somehow she needed to find a way to make the Catholic faith more accessible to them. The very next day Mary began The Frontline Faith Project. Frontline Faith gives MP3 players, preloaded with Christian content, to members of our armed forces throughout the world. Since its inception, more than 28,000 MP3 players have been distributed. These players have more than seven hours of spiritual content on them, including Christian music, prayers, and more. For many of these men and women, it may be the only form of worship or spiritual food they have access to for many months. There are currently three tracks available. The Catholic track has more than seven hours of content including a mass, prayers, and music. A Protestant track has also been released, and this past May, Frontline Faith put out a track called On the Home Front. This MP3 track was designed with service members’ families in mind. It’s the families that stay home and take care of everything so their loved ones in the military can focus on their jobs. These families left behind need spiritual nourishment and comfort, too. On August 28, 2012, Frontline Faith will debut Drowning In Lemonade, Reflections of an Army Wife, by Lynda MacFarland. Lynda’s story is one of walking with the Lord during a time of hardship, and it is a message of hope. Lynda will be donating all the profits from her book to The Frontline Faith Project. A donation of $24 will cover the full cost of providing one MP3 player for a chaplain or a service member. 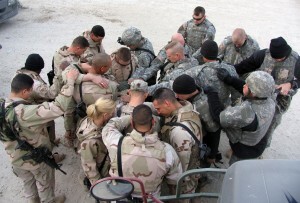 Our troops and their chaplains are stretched so thin, making their need for spiritual nourishment greater than ever. To make a donation or for more information, go to: The Frontline Faith Project.